Stadium Arena is going to host the 13th edition of the Swedish MMA promotion Superior Challenge. For the first time ever, the city of Norrköping will get the opportunity to experience an international MMA show at their home arena, and watch the Swedish MMA elite take on fighters from different parts of the world. Scandinavia’s largest martial arts event is ones again breaking new ground. 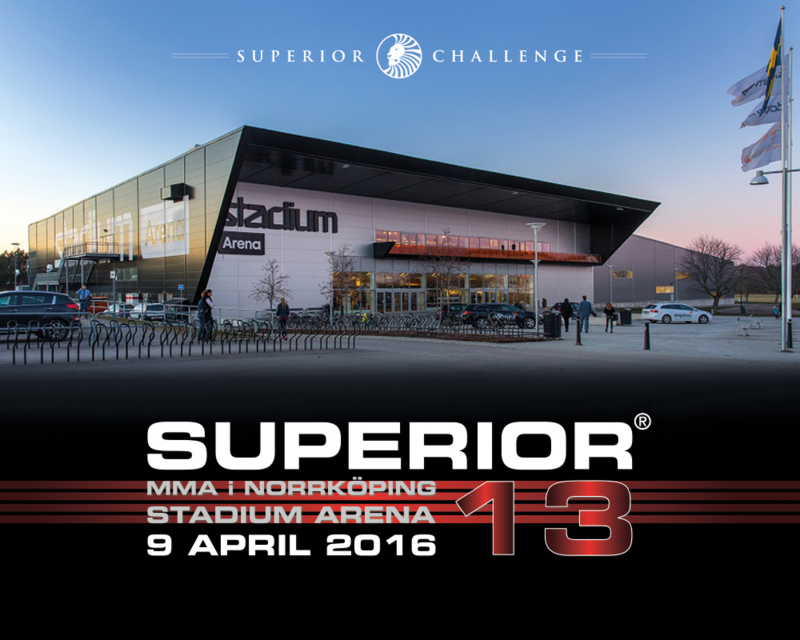 Superior Challenge 13 will be held on April 9th in Norrköping, Sweden, at Stadium Arena. The promotion offers high quality MMA bouts on an international level and has hosted some of the biggest names in the sport. Superior Challenge has both the audience and TV viewer records for all Nordic martial arts shows, and was the first MMA event at Hovet in Stockholm, was the first MMA event in Malmö with a crowded Malmö Arena, was the first MMA event at Scandinavium Arena in Gothenburg which had record ratings on TV, was the first MMA event in Helsingborg, Södertälje and now in Norrköping. The 13th edition of the promotion will, as usual, contain of MMA stars, champions and title bouts, where the public can watch local heroes and Sweden’s premier fighters take on major international names in the world’s largest MMA cage. Superior Challenge is one of five events in the world with top 20 ranked fighters competing for the promotion, and the event is aimed primarily toward those who enjoy adrenalin full and high quality sports entertainment. Stadium Arena was built in December 2008, eight months after the first Superior Challenge event took place, and is the home arena of the local basketball team Norrköping Dolphins. The Swedish company Stadium, has its headquarters and warehouse in Norrköping, which is Sweden’s tenth largest city. The old industrial town has about 136000 inhabitants and is situated in Östergötland in between the cities: Linköping, Jönköping, Örebro Eskilstuna, Västerås and Stockholm. The region has an old martial arts tradition, and has through the years produced many fighters in different disciplines such as wrestling, karate, grappling and boxing. – We began to plan a Swedish tour in 2012, which we called “MMA to the people.” Now, four years later, it’s really great that it’s Norrköping and Stadium Arena’s turn to host Superior Challenge, which will be the sixth event of the tour. This is a very fascinating region with an interest for martial arts, and the venue is incredibly fresh, modern and extremely well suited for MMA. We are currently working with a lot of interesting match-ups that will be announced shortly. Superior Challenge is one of the world’s largest MMA promotions, which produces high quality, and adrenalin-full sports entertainment for the MMA audience around the world. The organization has many years of experience in MMA and broad knowledge of the industry. And is internationally recognized as one of the world’s premier MMA events, and among five in the world with top 20 internationally ranked fighters competing at the events. The first event in 2008, broke the record attendance for all MMA events in Scandinavia, and the record have been broken three times. The last time was at Superior Challenge 8 in a packed Malmö Arena in Sweden with over 7000 people in the audience. Each event is estimated to have a PR value equivalent to approximately 17 million SEK gross, in Sweden alone. The Live TV broadcasts also broke the all time viewer record for all Nordic martial arts TV programs, with a minimum of 151000 viewers only in Sweden. In addition to nationwide TV broadcasts in Sweden, the shows are broadcasted in most parts of the world and Superior Challenge 7 reached approximately 100 million viewers worldwide. Superior Challenge is part of Superior Group International along with Superior Wear, Superior Gear, Superior Productions, and Superior Management. Thus, the organization is one of the world’s biggest MMA groups, with operations started in 2005. Since then the company has invested incredible resources on the sport and its athletes in Sweden, which has resulted in the current Swedish MMA market. The organization is also the largest Nordic exporter of MMA athletes, and consequently puts great importance on creating Swedish, Scandinavian and European MMA athletes, and heroes.